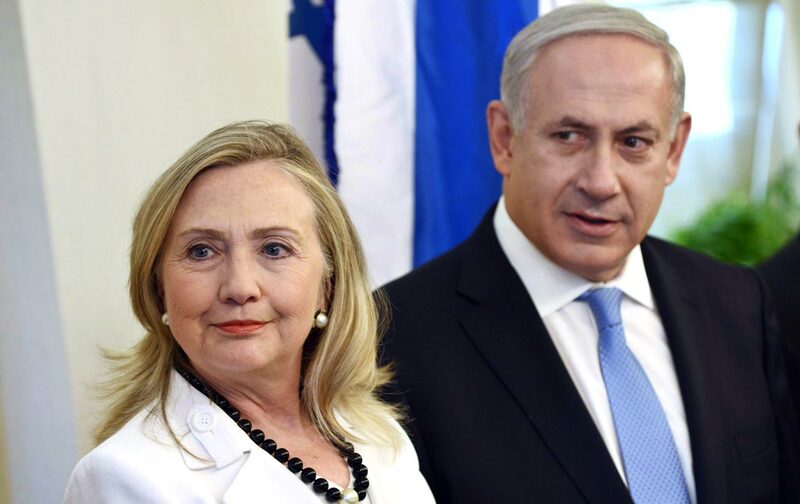 Can Clinton Mend Fences With Netanyahu? The Democratic presidential hopeful says she can make it right with Israel’s conservative prime minister, but offers no specifics. For Hillary Clinton’s presidential campaign, cozying up to Israel’s right-wing leadership—or at least eschewing criticisms of it—seems like a no-brainer. The groundswell of liberal disillusionment with the Jewish state hasn’t quite trickled up to the Democratic Party’s elites yet and, as the flap over the party platform during President Obama’s reelection bid showed, the grassroots can be bowled over on Israel issues. On the other hand, posturing that she will bring a new day to the relationship with Israel has potential upsides for Clinton: A longtime Clinton donor, Haim Saban, an Israeli-American businessman and Democratic Party megadonor with notably hawkish views, was cool on Barack Obama, and Clinton’s pursuit of his contributions is already in full swing—and has already borne fruit. Amid America’s broken Israel politics, tacking toward the Israeli right holds a lot of potential gain, with very little risk. On Wednesday evening, Clinton took her courtship of pro-Israel Democrats to another level: she penned an op-ed for the venerable Jewish newspaper the Forward. The piece got a flashy headline—”How I Would Reaffirm Unbreakable Bond With Israel—and Benjamin Netanyahu“—but its body displays a superficiality about the issues at hand and offers few concrete steps towards achieving its stated aims. The only real piece of outreach to Netanyahu, for instance, is a pledge to “invite the Israeli prime minister to the White House in my first month in office.” How much that will help remains unclear. Netanyahu’s antagonism to American liberals has never been merely about access—he enjoyed plenty under Obama—but rather about ideology: Like the American neoconservatives he is so close to, he abhors the liberal left because its notions of human rights, justice, and peace clash with his revanchist militarism. Instead of any concrete policy changes to either “reaffirm” the bond with Israel and Netanyahu, Clinton offers up platitudes, peppered with veiled shots against Obama. “The alliance between our two nations transcends politics,” she writes, as if it was Obama and not Netanyahu who politicized the relationship. “As president I will never stop working to advance the goal of two states for two peoples living in peace, security and dignity,” she says. But how? It was exactly in pursuit of these aims that Obama announced in 2011 that an Israeli-Palestinian peace should be based on the “1967 lines.” That was the longstanding American policy, but Netanyahu swiftly rejected it, immediately approving 1,500 new East Jerusalem settlement units in response. Netanyahu has shown time and time again that he’s not willing to make peace—the unifying thrust of his two stints in office has been to dash the very possibility. The pursuit of peace seems an unlikely foundation upon which to rebuild one’s relationship with Netanyahu. The pursuit of peace, then, seems an unlikely foundation upon which to rebuild one’s relationship with the Israeli prime minister. And Clinton must know it: It’s why, as Secretary of State, she had to repeatedly condemn Israel’s announcements of settlement expansion, particularly when they came at provocative moments (she called one such announcement, as Vice President Joe Biden was arriving in Israel, “insulting”). But all that talk was gone from Clinton’s brief op-ed. There was no mention of the occupation, let alone settlements. For their part, Palestinians barely featured in Clinton’s piece; millions of subjugated Palestinians’ legitimate aspirations merited zero words, their roles reduced to “a cleric encouraging worshippers to stab Jews.” If Clinton wants to tack toward a stance of willful blindness on the occupation, fine. But she should dispense with the mutually exclusive commitment to a two-state solution whose prospects are rapidly fading under the pressure of Netanyahu’s policies—the same policies, for the purposes of patching things up, she’s now ignoring. Then there’s the problem of the Iranian nuclear deal. As secretary of state, Clinton helped initiate the talks, and she disappointed liberal pro-Israel hawks by endorsing the agreement. In her Forward op-ed, Clinton says she will “remain committed to preventing Iran from ever acquiring a nuclear weapon, and to vigorously enforcing the new nuclear agreement.” But the rift over the nuke deal—a central one in precipitating icy relations between Obama and Netanyahu—won’t be papered over: For years, Netanyahu’s top aim for his policy toward America has been to roundly oppose diplomacy with Iran, often in apocalyptic terms. How will Clinton smooth over the seemingly unbridgeable gap between her support for the deal and Netanyahu’s steadfast opposition? We really don’t know. And, unlike the Palestinian issue, which American politicians are able to cast aside with few political risks, the Iran deal will likely require active defense; Israel and its lobby’s attacks against the deal, and the pitfalls they bring in relations with the Jewish state, will be harder to sidestep. And that gets at the real issue: The partisan gap that has emerged over Israel in the United States, over Israeli-Palestinian peace and over diplomacy with Iran, isn’t one merely of optics; the divergence between what Israel has become and American liberalism is not one of style but of substance. An op-ed from Clinton with no real plans of how to move forward won’t do the trick. The way to Netanyahu’s heart isn’t a prompt meeting upon taking office, it’s silently acquiescing to all his policies, no matter how detrimental to the peace efforts that Clinton says she has supported and will continue to support. In this sense, Clinton’s winking suggestion—the ahistorical implication that Obama, not Netanyahu, is to blame for the rift between the United States and Israel—is in keeping with the traditional right-leaning pro-Israel view that dominates within the Jewish state’s Washington lobby groups. Paying lip service to the moribund peace process while avoiding talk of the occupation and papering over the split on the nuke deal might make for good campaigning, but the contradictions are unsustainable as policy. If and when she becomes president, Clinton will have the same hard choices to make that Obama did.